Baltimore City Police are working with the Islamic community in hopes of closing a 2013 cold case. 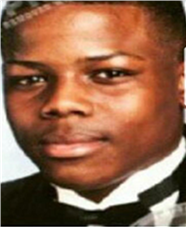 On January 11, 2013 Delroy Davis was shot and killed in the 2300 block of West Lanvale Street. The 23-year-old was returning home from work. Anyone with information that leads to an arrest and charges in this case can contact Metro Crime Stoppers and submit an anonymous tip at 1-866-7-LOCKUP. Your tip could lead to a cash reward of up to $4,000.